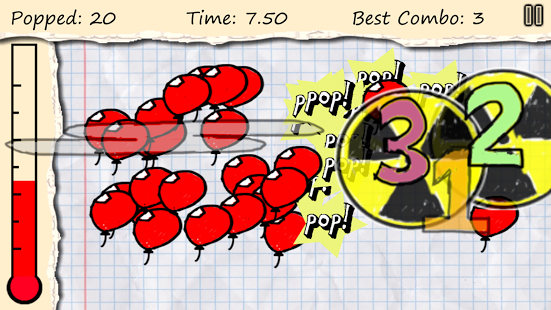 Doodle Nukeis a fun and chaotic reflex game for Android from OneButtonJoypad. In a similar vein to many other iOS and Android titles where the objective is to clear the screen as fast as possible, Doodle Nuke offers up a familiar style of play. Hundreds of doodles pop-up on screen every minute that need to be cleared by tapping or swiping them, but you’ll find that you’re often quickly overwhelmed. If you reach 100 doodles on-screen at once, you lose. Skulls add an extra layer of complexity to the tap-fest and if you tap one of those accidentally, that’s also bad. Doodle Nuke features a very basic mechanic but the gameplay is fun and challenging. As the doodles accumulate you’ll also notice nuclear symbols which grow in size over time. Tapping one of these will set off a ‘bomb’ which will clear the doodles around it. If you’re strategic, you can let the nukes grow in size to set off a chain-reaction when you activate one. This takes out a whole bunch of doodles at once and buys you some extra time. If you’re good, you may even be able to manage to chain together 10 nukes, triggering “Doodle Doomsday” which wipes the screen of all doodles and the pesky skulls. Doodle Nukelooks at first glance like a straightforward tap reflex title but the nukes add an interesting and fun twist to the game. The visuals are basic and look hand-drawn – but that’s kind of the point. 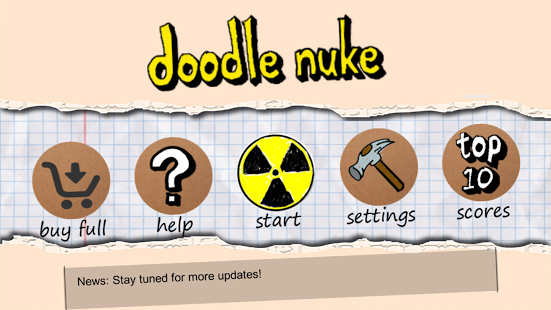 You can download Doodle Nuke now for free on Google Play. Doodle Nuke requires Android 4.0.3 and up.